Compare the used Acura MDX to the used Lexus RX at your Spinelli Lexus Pointe-Claire dealership and see all the benefits of the RX! 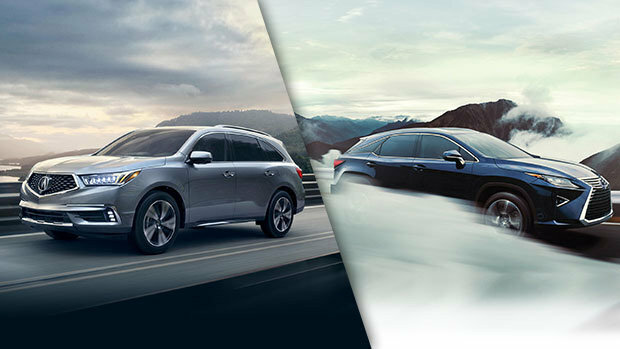 Compare the used Acura MDX to the used Lexus RX offered at Spinelli Lexus Pointe-Claire, the West Island Lexus dealership located near downtown Montreal and Laval. For the purposes of the exercise, we will compare the 2015 version of the third-generation Acura MDX (2014 - 2018) to the used Lexus RX of the same year. Buying a used vehicle can help you to purchase, at an affordable price, a luxury SUV that is very well equipped and in excellent condition. More often than we think, used vehicles have surprisingly low mileage, and that is so with many of our models in stock. Assembled in Lincoln, Alabama, the pre-owned MDX comes in 4 versions (MDX, Navi, Tech and Elite). It features a 6-speed Sportshift automatic transmission, a SH-AWD 4-wheel drive and a 3.5-litre V6 engine with direct injection and variable cylinder management. Its powertrain is guaranteed for 5 years or 100,000 km. The pre-owned RX that Spinelli Lexus Pointe-Claire offers has innovated by launching the luxury multi-segment category in 1998. The 2015 F-Sport version of the used Lexus RX features an 8-speed gearbox and is also available in a hybrid version (RX 450h) that consumes as little as 6.7 L/100 km in the city and 7.2 L/100 km on the road, while the pre-owned MDX consumes almost twice as much in the city, or 11.2 L/100 km and it does not offer any hybrid model. The Lexus RX is assembled in Canada at the Lexus plant in Cambridge, Ontario. The used Lexus RX powertrain group has a 6-year/110,000 km warranty, i.e. 1 year and 10,000 km longer and more than the pre-owned MDX. The utility space of the pre-owned RX is far superior to the one of the pre-owned MDX. The trunk of the used Lexus RX opens up to a volume of 1132 litres (40 cu. Ft.) behind the rear seat, while the used Acura MDX has only 425 litres (15 cu. Ft.) behind its rear seat. Among the many benefits of buying a used vehicle, it should be noted that all options added by the previous owner are included in the selling price of the vehicle. For instance, the equipment of a used 2015 Lexus RX model could include navigation, a sunroof, a head-up display, heated and ventilated front seats, a Mark Levinson audiophonic system with 15 speakers, and more. Spinelli Lexus Pointe-Claire is located in the West Island near downtown, Laval and the South Shore of Montreal. You will benefit there from extraordinary promotions and all the flexibility of the Lexus financing plans. Come and see us as of today!